I’ve often referenced my friends in my blog, and usually they are described as being cool or awesome. For the most part that is correct. But then I’m known to be really sarcastic so who really knows. Anyways, I have now have picture proof of how “amazing” my friends actually can be. My friend wanted to know my iPhone’s passcode, which I had no intention of sharing. I could tell by the look on her face that she decided to crack the code herself, and made a mental note to keep an eye on my phone. She still managed to somehow swipe my phone and began her hacking efforts. You’d think that when she saw that her attempts disabled my iPhone for 5 minutes she’d stop. 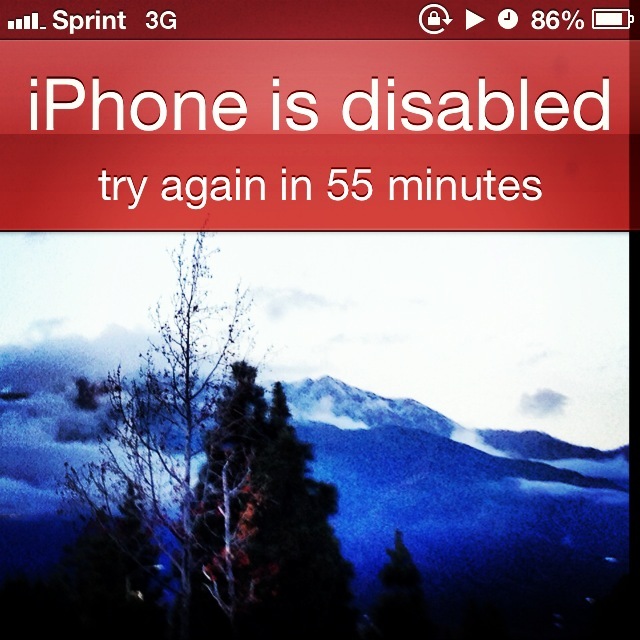 Instead her priority changed from cracking my code to seeing how long she could lock my phone. With that in mind, she just kept on entering random numbers locking my phone for 15 minutes, then 30 minutes, and finally all the way to 55 minutes. My twenty-plus year-old friend then handed me my iPhone with a saucy grin like a little kid who had just spilled an embarrassing secret. I was unsure of whether to be proud of her determination or annoyed with her joke, so I just smiled at her with a sarcastic “good job”. I’ll admit that I found her prank to be a combination of annoying and funny. Annoying because my iPhone was useless, meaning that Facebook, Instagram, and email were no longer viable options for avoiding possible small talk with some of her friends I didn’t know. However it was still funny to me how proud she was of herself. Plus her impish grin was rather adorable.